Having had a career in the beauty industry for over 30 years, it is the cumulation of Kate's experience that makes aura what it is today. With a passion for nurturing people, fulfilling their skincare needs & ensuring every client leaves feeling completely looked after - skin, body & soul! With this desire to look after people Kate also ensures a joyful working environment for her staff & provides ongoing training opportunities - so you can be assured of getting the most advanced treatments by knowledgable therapists. Kate's qualifications include Advanced Diploma Beauty Therapy, Post graduate Diploma's in Glamour & Photographic Makeup, Aromatherapy, Cosmetic Tattooing, Dermal Needling, Dermaplaning, HIFU & Plasma Skin Tightening, Cert 4 Workplace Training & Assessment & Laser Safety Officer Certification. Her passion for Aromatherapy skin care & health & wellbeing has led to the development of Pryority Skin & Body Care ~ organic skin care solutions. Check them out in our online store! Mildly mannered, calm & breezy & always smiling. 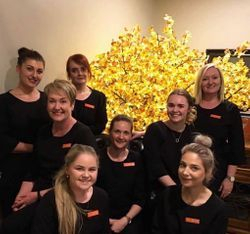 A results driven therapist Abbey excells in Nail Services, Waxing & Sugaring Lash & Brow Enhancement, Massage, Makeup, Tanning & Advanced Skin Treatments Abbey is fastidious in all she does & is caring, considerate & conversant. Abbey loves to make people feel good & is meticulous in her approach to treatments & making sure you are comfortable & well looked after. A joy to be around! Katrina loves to look after people, your precious time with Katrina will leave you feeling uplifted & rejuvenated. An expert at Nails, Lashes, Brows & Makeup, Kat is also exceptional at giving results driven skin treatments & focussed results in HIFU Face & Body Sculpting & IPL Hair Removal & Photo-Rejuvenation. Kat is passionate about people & all things Beauty. She loves to see you floating out the door with a smile from ear to ear! Vicki has her Cert 4 in Massage Therapy along with furthering her studies in Ayurvedic treatments such as Shirodahra & Indian Head Massage. A nurturing soul, Vicki has a knack of instilling a sense of calm. . . a massage treatment with her will have you leaving the spa like your floating on air! Tania is your welcoming smile to meet & greet & make your aura visit complete. In her role as concierge Tania is here to host your visit along with a major behind the scenes role of salon coordinator. Tania has wonderful organisation skills & ensures we all run smoothly, resulting in an uber relaxing experience for you. Sam is passionate about all things beauty! For perfect brows, perfect skin & gorgeous nails - polished grooming is Sams specialty. Sam started her beauty career in Makeup & loves to share her extensive knowledge, all the pro tips & secrets. Be ready for a makeover that stuns while feeling like you've had a soul overhaul too. Her Massages are out of this world & Sam loves to get you the visible results you are looking for in Advanced Skin Treatments. With Sam's beautiful caring nature - you'll feel like the most loved person on this earth after spending some time with her. Angie is a Remedial Massage Therapist & Spa Therapist with a passion for people & their wellbeing. Along with her Beauty Therapy skills, Angie has qualifications as a Remedial Massage Therapist & her skills in this area are paramount for anyone requiring Remedial Body Assessment & Massage Treatments. Her interests in health & wellbeing have resulted in Angie furthering her career in holistic Beauty Therapy. For complete care & rebalancing both physically & mentally, the amazing Angie is there for you. We are so privileged to offer Beauty Therapy qualifications via the NSW School Based Apprenticeship Program. 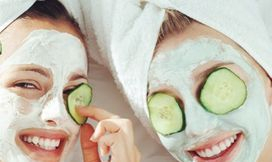 We carefully selected Amber & Sophie for their kind, nurturing personalities & their eagerness to emmerse themselves in a beauty therapy career. It is our commitment to them to develop their skills to an exceptional level which is the AURA standard. We do not charge for our apprentices to practice their skills so if you're interested in being on our "model call list" please let us know. It is not until they have mastered their skills at each level of their competency based training that we open them up for charged appointments. Support their learning & you will reap the rewards of experiencing amazing treatments in the not to distant future from these beautiful, dedicated young women.